James Harden was already on an unbelievable run over the last five weeks, and then Wednesday night happened. Harden is averaging 52.2 points over his last five games. Harden is the first player to score at least 55 points three times in a calendar month since Wilt Chamberlain did so in 1963. Harden is the first player since Shaquille O’Neal in 2000 to score 60 points and pull down 15 rebounds in the same game. Tonight, James Harden became the first player with 60+ points and 15+ rebounds since Shaquille O'Neal in 2000. 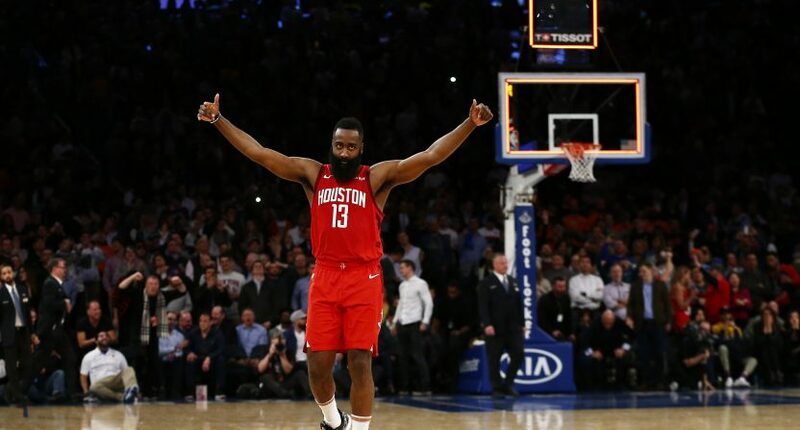 Harden outscored the Knicks’ starting five 61-59. James Harden outscored all 5 of the Knicks’ starters combined. Good lord. Harden has scored more than 1,000 points over his last 25 games. James Harden has now scored over 1,000 points in his last 25 games. Harden has scored at least 56 points three times over the last nine days. Kareem Abdul-Jabbar — the NBA’s all-time leading scorer — *never* scored 56+ points in a game. Kareem Abdul-Jabbar, the NBA's all-time leading scorer, never scored 56 or more points in a NBA game. James Harden has done it three times in the last nine days. Harden is averaging 42.5 points since Dec. 11. Harden is now averaging 36.3 points on the season. James Harden is averaging 36.3PPG after tonight's 61 point outburst. Michael Jordan's 37.1PPG season is within reach. And the most incredible one: all 261 of Harden’s points in this five-game stretch have been unassisted. The unassisted point streak is overall at 263 for Harden. James Harden scores 61 points in which every single one was unassisted. The streak is now 263. Harden will look to keep up his insane run when the Rockets host the Raptors on Friday night in Houston.